On June 26th 2014 I was lucky enough to successfully complete my very first Everesting, 15 times up the highest road in the UK, Great Dun Fell. 140 miles and 31,234ft was enough to claim the hill before someone else beat me to it. It had taken over 15 hours and was a day I’ll never forget, however, it was also a day I was in no hurry to repeat. Cycling is all about suffering! Well ok maybe not “all” about suffering (we all have those days when the sun is shining, the gentle breeze is on our back and the whole thing seems rather enjoyable) However, the more we push ourselves, the more it eventually starts to hurt. The only problem is that we forget all about this suffering almost as soon as it’s over, we can be half way through a tough event thinking to ourselves “there is no way I’m riding this again next year” “in fact I might even sell my bike” then by the time we’ve made it home, the pain is forgotten and we’re ready to sign up all over again. Less than 24 hours after completing Dun Fell, I was sharing ideas with my partner Mairi for a second Everesting. As I cautiously approached the subject, Mairi gave me an initial look as if to say “have you lost your mind!” thankfully this was soon followed by acceptance, and then even encouragement. Choosing the climb wasn’t actually such a tough decision, after doing the highest I figured it was time to have a go at the hardest. 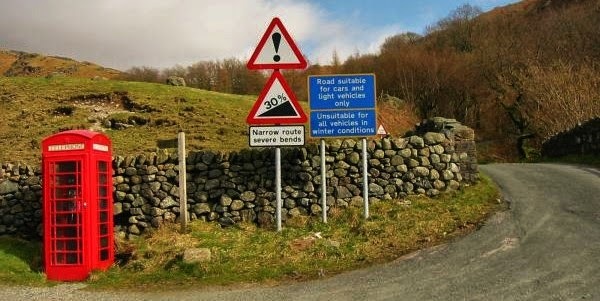 Arguable the toughest and most feared climb in the UK is the legendary Hardknott Pass in Cumbria. The Romans build the original road back in the 2nd century, this linked the coastal fort at Ravenglass with their garrisons at Ambleside and Kendal. During the Second World War the area was used for tank training, this completely destroyed the original track. When the war was over, it was decided the road should be repaired. Only this time it was given a tarmac surface, this provided the first ever direct motor route between Eskdale and Ambleside. 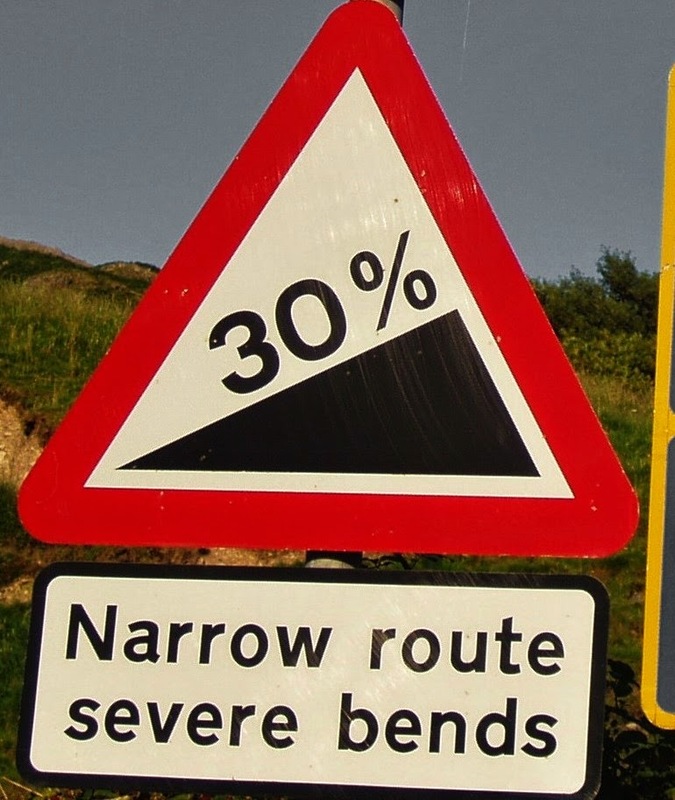 As you approach the climb from Eskdale you’ll see an old fashioned red telephone box, next to this is a sign warning you of 30% gradients ahead. The climb raisers up through some trees and over a cattle grid, it’s not long before you are faced with a number of 25% switchbacks. Once you’ve tackled these the landscape opens up, and on doing so reviles why people fear this climb so much. In the distance the summit is almost visible, but before that are more sets of switchbacks, only this time steeper than the first. The final hairpin is a savage 30%, and is followed by a steep drag that only eases off once you’re near the top. The total ascent is around 970ft with a summit of 1,289ft, the pass would need climbing 30 times to reach the 29,029ft target. July 20th 2014, 4.30am and I’m on my way over to Hardknott. The forecast is a warm 19c with a light westerly wind, perfect conditions for an Everesting. Being slightly paranoid I use my phone to check the Everesting website, the last thing I want to find is that someone has claimed the hill the day before I try it…. they haven’t. By 6.30am I’m parked at the top of Hardknott, bike out, gear on, and ready to go. With my Garmin started I begin descending, the mist is lying thick in the valley below, and that’s right where I’m heading. I’d ridding up this side of Hardknott several times but this was my first time down, it was a bit of a shock! I could remember the road surface being rippled, quite bad in places, almost as if the tarmac was slipping down the hill. Riding up this was never very pleasant but going down was even worse. The worsted affected areas were the steep sections, it felt like hitting a whole bunch of small pot holes which made controlling the bike somewhat of a battle. About half way down I passed a rider coming the other way, and a little further down the hill, parked at the side the road, was a campervan “He’s up early, I wonder if he’s Everesting” I thought to myself, in what was more than likely another moment of paranoia. The descent took between four and five minutes, any quicker would have been getting dangerous. After I’d rattled my way down to the bottom, it became pretty clear the descents weren’t going to be much of a chance to rest, but anyway I’d started now so it was time to think positive and get on with it. I began tapping on the pedals and soon hit the first set of switchbacks, spinning a gear was almost impossible (even with the 11-32 cassette I’d fitted earlier in the week) I couldn’t see the summit due to the mist, but after a brief “levelling out” the next set of switchbacks popped up in front of me. One set at 25% followed by another set of 30%, I wouldn’t say I was struggling but it was far from easy, I continued up the steep drag and eventually made the top. No sign of the cyclist I’d spotted earlier “told you, you were being paranoid” I thought to myself. The climb had taken 14m35s, which seemed pretty reasonable to me. The roads were damp so I clung on to my bike, and began the twisty descent back down to the bottom. I was feeling good so just kept on knocking out the reps. hairpin after hairpin I’d make my way up, followed by that rollercoaster run back down again. The day was getting lighter and the mist beginning to lift, now only the summit was left covered. As I completed my 8th ascent, I’d been riding for 2 hours 50 minutes and had climbed around 7,700ft. That first ascent of 14m35s had now slipped to 16m13s, not bad I thought but getting gradually slower. Every other rep I’d briefly stop at the car to take on fuel, it was one of those sticky humid days, so keeping well highdrated was going to be important. My stops would only take about 30 seconds, and meant not having to carry any heavy liquid/food on the bike, a nice little bonus on such a steep climb. Heading down to begin number 9 I spotted two riders coming the other way, and on passing each other I got a bit of a surprise. The guy in front was wearing a grey and white, Hells500 cycling jersey. The Hells500 are the Australian cycling club who came up with the whole idea of Everesting, and I knew these jerseys were only available to people who had completed their own Everesting. Going too quickly to stop, I continued the final couple hundred yards to the bottom. I was keen to know who he was and what he was doing on this climb, I started rep nine with a little more urgency than the previous eight. He was already negotiating the first set of hairpins, I had to jump out the saddle and really stamp on the pedals on order to gain on him. My climbing heart rate had been sitting somewhere between 160 and 175bpm, this was higher than I wanted but difficult to avoid with the steep gradients. This latest little effort pushed it to 189bpm, far too high but I caught the rider around half way from the top. I said hello and pointed out his jersey, I mentioned Everesting and he told me he’d had a failed attempt today “On Hardknott?” I asked “Yes” he replied (turns out maybe I wasn’t so paranoid after all) He told me he’d started at 4.45am and completed two reps, he’d then decided against it as the descents were just too challenging. He’d been back to his B&B for some more sleep, and a full English breakfast, and was now just heading out for a ride. “Have you ever Everested before?” I asked “Yes I was first in the UK” He replied. It was at that point I realised who he was, Pierre, a French guy who had completed the first UK Everest back in March this year. Pierre had commented on my Great Dun Fell Everest on Strava, however I’d never actually met or spoke to him. I introduced myself and I think that was the moment, Pierre realised I was Everesting too! I explained it was my 9th rep and we chatted our way to the summit. I’m pretty sure we were both a little baffled by the coincidence, but never the less very pleased to of met each other. “It’s all yours” said Pierre, he wished me luck and continued on his way. My encounter with Pierre had given me a good mental boost, and at 14m12s that 9th ascent was also my quickest (although I did wondered if I might pay for this later) I climbed up for my 10th, then 11th, 16:08 and 16:37. As I started number 12, I’d been on the go for 4 hours and it was starting to feel hard. I remember thinking that physically, I felt similar now to after 20,000ft on Great Dun Fell, but so far I’d only done half of that. There was just no rest bite, no sooner would I reach the top it would be time to hang on for dear life back down again. 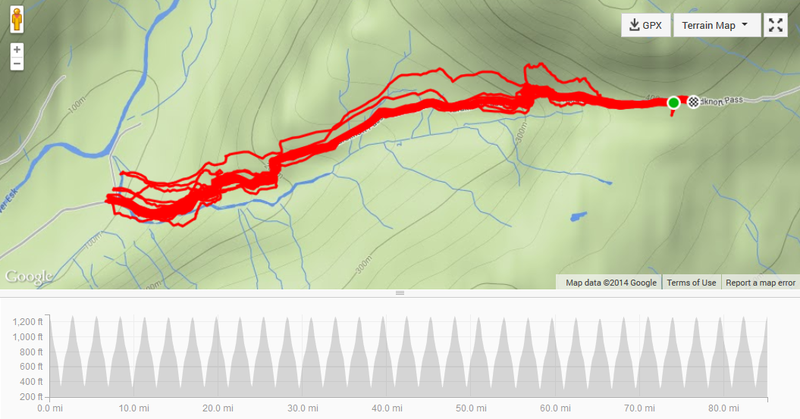 My ascents slipped to over 18 minutes, 13, 14 and 15 all went the same way. This really was hard, just short of 6 hours and it was 15 down 15 to go. I couldn’t get my head around doing it all over again, and knowing I’d only slow down further wasn’t helping. My descents were also gradually getting slower, the constant heavy breaking was effecting my grip, and I had to back off a little in order to control the bike. I needed to remind myself that no one was forcing me to do this “ignore any pain and focus on the good bits” I thought to myself. I ignored the pain in my knees and enjoyed the sun that kept bursting through the clouds. I ignored that even the soles of my feet had started to hurt, and stubbornly tapped out a rhythm regardless. With a lot of ignoring and a good bit of encouragement from passers-by, I’d made it to number 18. My partner Mairi and Dad Paul were waiting at the top, they’d driven over to show their support, and after 7 hours in the saddle I was more than pleased to see them. Mairi helped with the feeding and my Dad joined in for a few reps, it wasn’t getting any easier but it was heading in the right direction. I finished number 20 and was still managing the ascend in around 19 minutes, I was two thirds done and 8 hours had passed. Only 10 more times up this damn hill and I’d be finished, only thing is I was slowing down, and this could mean another 5 hours. I just needed to keep riding, keep climbing and keep descending. My times slipped a little further, my fuel stops were also getting longer and more frequent. Half way up my 24th I met Pierre coming back from his ride, he asked how I was getting on and joined me back up to the top. It was another welcome distraction and he seemed sure I would finish it now, hopefully he would turn out to be right, I shook his hand and off he went. Pierre might have been confident but my body didn’t seem to agree with him, running on empty I grovelled up the climb 3 more times. My 27th ascent was the slowest of the day at 22m31s, I had that feeling you get just before you hit “the wall” and grind to a halt. I’d been trying to keep to a good pace all day and time wise I was doing ok, only down side was the extra effort had made it harder to eat. I’d usually have the odd gel with my food when riding this hard, but I’d skipped these as I didn’t fancy anything sweet. I stopped at the car for 5 minutes and made sure I had plenty of high energy fuel, gels and drink, it wasn’t what I fancied but I needed it. The short break did me the world of good and I set off down again, by the time I started number 28 I felt noticeable better. Of course my legs still hurt, as well as other parts. But no longer did I feel I was about to bonk, plus, I only had 3 more to go. For 11h40m I’d been fighting with this hill, I’d clocked 78 miles but more importantly 26,200ft. It had been a tough day but an enjoyable one, there’s something about these long rides that leave you with a lot to think about. You’d think that simply riding up and down the same hill all day would get a little dull, but not so. It’s all about a bunch of small targets in order to reach one big one, combine that with support from friends, family and passers-by, seeing the sun rise then fall as well as everything else in-between and you have all the ingredients for a far from dull ride. It seems that you are quite expert at blogging. I need to get an agent for double glazing companies reviews guide. Since you have good idea on blogging, can you help me to finding an agent for my problem?